This is just the review I’ve been looking for! We have 5 cats and one of them is pushing 14! Sadly, because of her age she doesn’t get to climb around like the other cats. 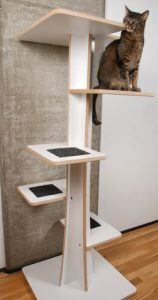 The Vesper Cat Furniture – V-Tower looks very stylish and would work well in our living room. It looks like it has really good reviews on Amazon! We have a dog in the house as well…my only concern is that we want to feed the older cats away from the dog. The dog weighs about 30lbs…do you think she could knock this tower over? I wouldn’t think so, but thought I would ask. Thanks for the great review…can’t wait to order one of these! That’s awesome! Thanks for sharing your pet fam with us! Feeding cats around dogs is always tricky since dogs are larger and very food driven, lol. In this case, I would recommend that you get some additional structures in place. You should get the Go Pet Club Tree 72″. 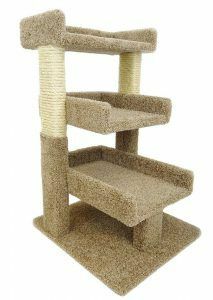 Since it has the two ramps, your older cats will be able to reach the top. Because it has different twists and turns that the animal will have to make, your dogs won’t be able to climb it. No matter which tree you get you might consider securing to the wall with an L bracket and screw-style wall anchor. Multiple cats with occasional foster dogs and kittens throughout the years and my cat’s tree is quite secure. Plus living in an apartment there is no thumping noise to annoy neighbors that can happen from some trees when you’ve got 3 to 9 cats chasing each other over it. Thanks for sharing this valuable information with us. Yes, this will work and I also agree. What always surprises me is how some people put their trees in the middle of the floor. That is insecure for most trees and also doesn’t feed the cats instincts at all. Before reading your blog about structures for cats to go on, I had absolutely no idea there were so many varieties. I think it’s brilliant having all these versatile options for owners to choose the best ones, especially for older cats. The cat we have at the moment only enjoys climbing up to our bed, and he spends hours and hours asleep on it 🙂 The only structure he goes for on a daily basis is his scratching post, which also is a climbing structure, but I don’t think we’re breeding climbers in our cat colony so far. The future might be different, who knows! Thank you for this post, and I will most certainly refer back to it when the time comes and we have another cat who is a bit more adventurous than the ones we’ve had to date. I’m quite sure it will have a whale of a time climbing to its heart content on the structures you have described in such great detail here…thanks again, Marlinda. Although most cats enjoy climbing not all cats do. I first realized this by the cats in my neighborhood that like to lay on the ground instead of taking to trees. Along the years, I’ve come to understand cats a little bit better, after living with them for so long. That’s true, most cats do enjoy climbing, but not all cats seem to do so. I think it’s how comfortable they feel in their surroundings, and their form of retaliation, should this be required. They are after all, predators, and ideally, having the advantage of height over the ‘enemy’, or their prey, would give them the upper hand. 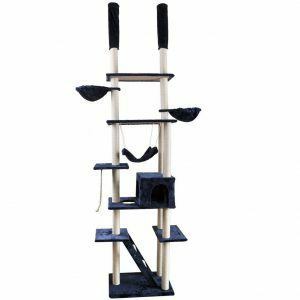 Yes, you certainly have provided a wealth of information about climbing structures for cats, which is really fantastic, and you’ve done a wonderful job of explaining all about them. Thank you once more for a fantastic site. If you get a taller tree, you’d be surprised how cats immediately take to it. Climbing is in their nature, their dna. Try it. You’ll,make your cat very happy. Hey Andrea! That’s so true. Thanks for sharing and commenting 🙂 Have an awesome rest of your weekend! 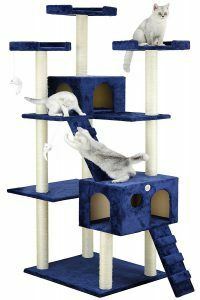 Truth be told, you should have multiple cat trees in your home in addition to other structures like wall mounted climbing platforms, scratching posts, etc. But of course, you gather these one by one and collect them like anything else that is bought in increments. Pots, pans and kitchen appliances are a good example of what I’m talking about. You buy something here something there and before you know it you have a cooking arsenal. That being said, I recommend you buy for the weakest member in mind first then factor in the rest. This means that you buy first for your senior cats and factor in the rest. The next to consider is the young one if s/he is a kitten because they are also more frail than an adult cat. 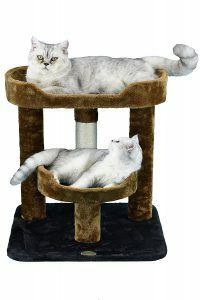 With this in mind, and since you are looking for a cat tree, I would recommend the Go Pet Club 72 inch Cat Tree Condo. 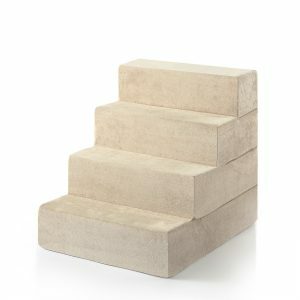 It has 2 ramps which will help your seniors and young cat safely reach heights while giving your adults plenty of platforms to jump on. There’s also multiple condos, toys, etc. Its really a lot packed together in one tree. I don’t want to go on too long but this really is a great tree that your cats will enjoy. My wife and I have been researching cat trees and we are interested in the best space saving design. Are there any wall mountable cat trees for older cats? We would prefer to not have a base but still have it accessible so our older cat can still climb up with ease. Thanks for reaching out to us with such a good question. When it comes to older cats there aren’t much options when it comes to wall mounted cat climbing structures but we have just the right solution for you! It is a model made by CatastrophiCreations that is basically all ramp and platforms going up or along the wall. You will have to buy two or three of this model as it is small especially compared to some of their other models. 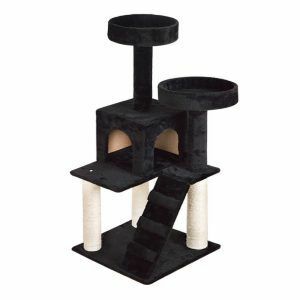 Here is the wall mounted cat tree we recommend: Click here to learn more! 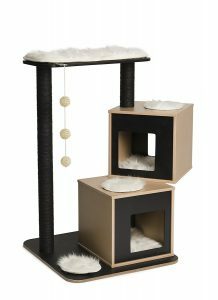 Here is the wall mounted scratching post we recommend: Click here to learn more! My cat is getting old, and she is quite fat now because she eats a lot and doesn’t move. If it continues that way, she will get sick, and I really don’t want that to happen! Just a question, please. In a few weeks, we are moving to another house, so I would like to know if it’s possible to unfold it reconstructs it once we are installed? 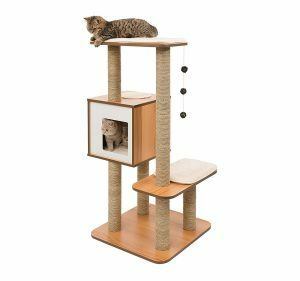 That’s awesome and I’m so glad that you have chosen the best cat tree for your older cat. This tree is able to be disassembled. The posts screw into the platforms so it is easily to put it together and take apart. This was so handy to find a comparison of so many options for our older cat all in one place. It’s always nice to be able to compare features side-by-side. I can see why the Vesper V is your number one recommendation. I love the cat condo so low to the ground, and it’s definitely designed for comfort. I wonder if you have a recommendation on the best way to keep the components clean? Thanks for your help and all the great info! Thanks for your feedback and question. Since we are dealing with something your pet will be using, you want to use a natural cleaner. The good thing about the Vesper V is that it doesn’t have a whole lot of extra covering. Have you ever heard of the product Dr. Bronner’s? Well, they have a product called “Sal Suds” that is a biodegradeable soap and safe to use on wood. You can either use that or Castile soap which this brand carries as well. 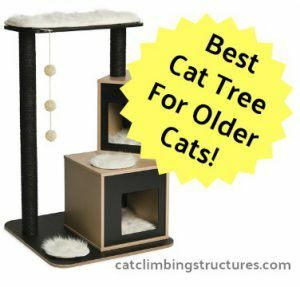 Agree with many of the comments as I have an older cat so finding a list of cats trees that are made specifically for him is really useful! Anything that has a gentle slope that allows him to be able to get onto the construction I would always advise rather than having to do a big leap!